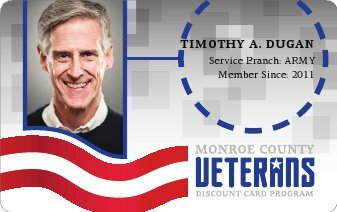 Monroe County Veteran Service Officers will help you navigate the Department of Veterans Affairs' bureaucracy, and our services are free. We will help with gathering the information necessary to support a claim, file the claim, and track the claim through the VA system. We can also assist with filing appeals for denied claims. We strongly recommend that you make use of the services provided by County Veterans Service Officers. Our expertise can help you avoid the pitfalls and delays that missing paperwork or improperly filled out claim forms can cause. Additionally, the Monroe County Veterans Service Agency (MCVSA) can review all possible veteran’s benefits and programs, including state and local benefits. The Director and staff are accredited representatives; as such they are authorized by the VA to present claims for further development, institute appeals from decisions made by the Veterans Benefits Administration, and follow through to final disposition with representation in Washington. With this accreditation, the County Veterans Agency offers a personalized service not available from other sources. Please contact our office at 585-753-6040 or email us at mcveterans@monroecounty.gov with any questions you may have about the following summary of VA benefits. VA can pay you monthly compensation if you are at least 10% disabled as a result of your military service. Service-connected disabilities rated at 0% will still be treated by the VA medical center. MCVSA Note: A recent New York State constitutional amendment eliminated the requirement that veterans who were disabled in the actual performance of duty in any war be receiving disability payments from the United States Veterans Administration in order to qualify for additional points on a civil service examination for appointment or promotion. Under the proposed amendment, the disability must only be certified to exist by the United States Department of Veterans Affairs. This means that veterans with a 0% disability rating by the VA qualify for additional points on the civil service examination for appointments or promotion. You can receive a monthly pension if you are a wartime veteran with limited income, and you are permanently and totally disabled or at least 65-years-old. MCVSA Note: Monroe County veterans or their surviving spouses who require the regular attendance of another person to assist in eating, bathing, dressing and the like may qualify for a VA special pension benefit called Aid and Attendance. It also includes individuals who are blind or residing in a nursing home due to mental or physical incapacity. Assisted care in an assisting living facility also qualifies. Nursing home or assisted living facility residents who receive $50 a month for their personal use from Medicaid may also receive an additional $90 per month from the VA.
Housebound is an enhanced or special monthly pension benefit paid in addition to basic pension; it is generally designed for veterans who are permanently and substantially confined to his/her immediate premises. World War II. December 7, 1941 through December 31, 1946, inclusive. If the veteran was in service on December 31, 1946, continuous service before July 26, 1947, is considered World War II service. Persian Gulf War, Operations Enduring Freedom and Iraqi Freedom. Beginning August 2, 1990 through date to be prescribed by Presidential proclamation or law (current). MCVSA Note: In addition to meeting the criteria for serving active duty during a "period of war", a veteran or their surviving spouse must also meet the health criteria and "countable income" guidelines set forth by the VA in order to qualify for pension benefits. Just outside Monroe County in the heart of the Finger Lakes region, the Canandaigua VA Medical Center provides inpatient and outpatient care to veterans living in upstate New York. Click here for more Information about the hospital. In addition, the Department of Veterans Affairs also operates a VA Outpatient Clinic in downtown Rochester (465 Westfall Road, 14620). Eligible Veterans can obtain medical and dental benefits, as well as prescription drugs at low or no cost. For general information, call (585) 463-2600. For eligibility information, call 1-888-823-9656, visit the VA online, or Click here for a Quick Eligibility Check. Combat Veterans - VA provides free health care for veterans who served in a theater of combat operations after November 11, 1998 for any illness possibly related to their service in that theater. Time Limits: You have five years from the date of your discharge from active duty on or after January 28, 2003. You have until January 27, 2011 if you were discharged from active duty before January 28, 2003 and were not enrolled as of January 28, 2008. MCVSA Note: To enroll into the VA Western New York Health Care System you will need to complete VA Form 10-10EZ and mail it to: Buffalo VA Medical Center, 3495 Bailey Avenue, Buffalo, NY 14215. For specific questions about your individual enrollment, please call 716-834-9200. 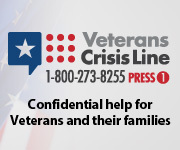 The Veterans Crisis Line connects Veterans (and their families) in crisis with qualified, caring responders through a confidential toll-free hotline, online chat, or text. Veterans and their loved ones can call 1-800-273-8255 and Press 1, chat online, or send a text message to 838255 to receive confidential support 24 hours a day, 7 days a week, 365 days a year. More about the Veterans Crisis Line. VA provides assistance to veterans with service-connected disabilities to prepare for, obtain, and maintain suitable employment. For veterans with serious service-connected disabilities, VA also offers services to improve their ability to live as independently as possible. Assistance to veterans may be provided in the form of job search, vocational evaluation, career exploration, vocational training, educational training and supportive rehabilitation services. Time Limits: Generally, veterans have 12 years from the date VA informs them that they have at least a 10% rating for a service-connected disability. MCVSA Note: Additional employment resources and opportunities for the Monroe County veterans community are available on our employment page. The Veterans Opportunity to Work (VOW) to Hire Heroes Act of 2011, provides seamless transition for Servicemembers, expands education and training opportunities for Veterans, and provides tax credits for employers who hire Veterans with service-connected disabilities. Click here for more details. MCVSA Note: Honorably Discharged Monroe County Veterans who served in combat or have an Expeditionary Medal may qualify for the New York State Veterans Tuition Award. Other state benefits and tuition assistance programs are available for disabled veterans, National Guard Service, Reserve and Active duty military service members. Please call our office to find out more about these great benefits. Certificates of Eligibility or Home Loan Guarantees are furnished through the Department of Veterans Affairs. For more information, you can call the VA Home loan center at 1-888-768-2132 and follow the prompts for Home loan eligibility, or visit the Veterans Affairs page online. To apply, download the form 26-1880 Request for A Certificate of Eligibility. Certificates of Eligibility for Education benefits are issued by the Department of Veterans Affairs once processors receive the claimant’s application for benefits. Applicants can fill out and submit forms for education benefits using the Veterans Online Application website, also known as VONAPP. For assistance with application forms, please call the Monroe County Veterans Service Agency at (585) 753-6040. 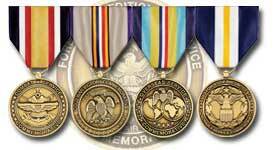 The Monroe County Veterans Service Agency will assist you in obtaining your or your family member’s decorations (medals and badges) from the military service. For decorations/medals it can take up to two years. VA offers a number of home loan services to eligible veterans, some military personnel, and certain surviving spouses. Guaranteed Loans: VA can guarantee part of a loan from a private lender to help you buy a home, a manufactured home, a lot for a manufactured home, or certain types of condominiums. VA also guarantees loans for building, repairing, and improving homes. MCVSA Note: SONYMA, in conjunction with the New York State Department of Veterans' Affairs, is pleased to offer the Homes for Veterans Program that will enable more U.S. military veterans to buy their first home or move to a different home. A recent change in Federal law enables SONYMA to waive the first-time homebuyer requirement for any veteran (and their spouse or co-borrower) who: Served in active military, naval, or air service and has been discharged or released from their military duties under conditions other than dishonorable. Closing cost assistance is available for the Homes for Veterans Program. To apply for a SONYMA loan you must contact one of the Participating Lenders offering the Homes for Veterans Program located statewide. Visit the SONYMA's Homes for Veterans page for more details. Servicemembers' Group Life Insurance (SGLI) is low-cost term life insurance for service members and reservists. Coverage of up to $400,000 begins upon entrance to military service. Generally, it expires 120 days after completion of service. Traumatic SGLI is automatically included in SGLI and provides for payment up to $100,000 for service members who lose limbs or incur other serious injuries. Veterans Group Life Insurance (VGLI) is renewable term life insurance for veterans who want to convert their SGLI up to an amount not to exceed the coverage that was provided during military service. Veterans must apply within one year and 120 days from separation. Rates increase with age. Service-Disabled Veterans Insurance, also called "RH" Insurance, is for service-connected veterans. Coverage is $10,000. Certain individuals may be eligible for a $20,000 supplemental policy if they are totally disabled. Veterans must apply for RH within two years of being rated service connected by VA.
Service members who died on active duty. Veterans who died from service-related disabilities. Parents' DIC is payable to some surviving parents. The benefit is based on financial need. VA Civilian Health and Medical Program (CHAMPVA) shares the cost of medical services for eligible dependents and survivors of certain veterans. Dependents & Survivors Education & Training: Some family members of disabled or deceased veterans are eligible for education and training benefits. MCVSA Note: The un-remarried surviving spouse of a deceased Monroe County Veteran may be eligible to receive a veteran's alternative property tax exemption provided that the title to the property is in the name of the veteran's un-remarried, surviving spouse, who continues to use the home as the primary residence. In the event both husband and wife are deceased, the exemption can be continued for the veteran's dependent mother, father, child or children under 21 who have legally received the property and who use it as their primary residence. VA offers certain benefits and services to honor our nation's deceased veterans. Time Limits: There is no time limit to claim reimbursement of burial expenses for a service-related death. In other cases, claims must be filed within two years of the veteran's burial. A fully trained, experienced office staff assures the claimant of efficient, confidential, and compassionate service. Accredited Representatives are available Monday through Friday from 8:00am to 4:00pm. Call us at 585-753-6040 or email us at mcveterans@monroecounty.gov.